A More Reliable Article about Copper Use – microBEnet: the microbiology of the Built Environment network. 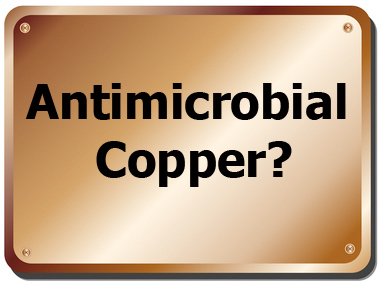 I posted an article in the past discussing the benefits of copper as an antimicrobial agent, but the authors had a huge conflict of interest. However, I still found the idea of using copper as an antimicrobial agent very interesting and decided to post about this article (PDF available here). This review article from 2011 is published in a reliable journal (Applied Microbiology and Biotechnology) and details the advantages and disadvantages of copper use. Though it is a bit dated, the general principles seem to have stayed consistent. Authors Jutta Elguindi, Xiuli Hao and Yanbing Lin summarize the importance of copper as well as the consequences that increased copper mining may have. Copper is used as an effective antimicrobial agent in a variety of settings such as agriculture, hospitals and food production and processing plants. The increased use of copper calls for an increase in copper mining and recycling, and although this may be economically beneficial, the environmental consequences need to be researched. There has been an increase in disinfectant-resistant and copper ion-tolerant pathogens, but copper alloys have been found to kill some of those microorganisms. Unfortunately, this article is behind a paywall, but is an easy read and provides a great summary for those interested. It also discusses suggestions for cleaning up contaminated sites and soils that have been published by other researchers. Sabreen Aulakh is a fourth-year undergraduate research assistant in Eisen lab. She is currently working on a microbial aquarium project, surveying microbes found in indoor aquariums on the UC Davis campus. This was also the case in one of the articles I cited and summarized in my comments to the earlier post in which Rensing was an author: Grass, Rensing, and Solioz, 2011. “Metallic Copper as an Antimicrobial Surface.” Applied and Environmental Microbiology Mar. 2011, p. 1541-1547. I pointed to the ICA funding for that article in my comment (http://microbe.net/2014/03/05/copper-as-an-antimicrobial-industry-as-a-funding-source/#more-15257). The link in this post, “A More Reliable Article about Copper Use,” takes me to a log in for the UC Davis library VPN access — https://vpn.lib.ucdavis.edu/dana-na/auth/url_default/welcome.cgi. That login seems to require an account at a UC Davis. I do not have access to that. So, for readers who, like me, don’t have access to the UC Davis Library, the article is in Applied Microbiology and Biotechnology, (2011) 91:237â€“249. DOI 10.1007/s00253-011-3383-3. That being said, funding and possible financial rewards only help reveal POTENTIAL conflicts and should make one add an extra few bits of skepticism. However, I think it is also not wise to discount some claims just because people with a financial interest in it would benefit. I personally believe it is possible to assess the science behind some studies even if the authors of papers have potential conflicts. I think it is pretty clear from looking at the 100s+ papers that report on cooper as an antimicrobial that it in fact is an antimicrobial. Sure the copper industry is trying to sell this concept and most likely overselling it much of the time. More interesting I think that whether or not copper is an antimicrobial is the question of whether using such an antimicrobial is in general a good idea or not. Most of the studies I have found on copper antimicrobial activity focus on its effects on specific organisms in the lab or in the “field” (e.g., hospitals). I could not find anything on long term con sequencing of killing microbes on copper surfaces. Another issue that I think is important and interesting is whether or not copper affects all microbes (as some of the copper industry folks seem to be claiming) or whether it has non uniform effects. And in my reading of the literature it certainly seems that copper does not affect all microbes in the same way. A good example of this is a recent study in Cell Host & Microbe (alas not open access): http://www.cell.com/cell-host-microbe/retrieve/pii/S1931312813000681. In this study the authors report that the fungal pathogen Cryptococcus neoformans appears to resist killing by copper (which is a host defense mechanism) by neutralizing copper. Would this apply on copper surfaces? I do not know. But seems likely that this bug would be resistant to copper surface affects too. A review of this paper and commentary in Nature Reviews Microbiology (again, not open access) http://www.nature.com/nrmicro/journal/v11/n5/full/nrmicro3013.html discusses the implications of this study. There are many other reports on copper resistant microbes (both pathogens and non pathogens) including some studies that have found ones resistant to copper surfaces. For example see http://aem.asm.org/content/76/5/1341.short (by some of the same authors Hal Levin discussed in the previous post he mentions). (So – if these researchers are biased to show that copper kills microbes what does it mean when they show some microbes are resistant to copper — I tend to think their work is not biased in any obvious way). Anyway – I could go on. But I personally think it is quite clear copper IS an antimicrobial both in solution and on surfaces. It;s effects however vary by dosage, environmental conditions, and by the organism. Here is an open access paper on “A demonstration of the antimicrobial effectiveness of various copper surfaces” by Victor K Champagne and Dennis J Helfritch. See http://www.jbioleng.org/content/7/1/8. Not sure if the authors received money from Copper groups but they claim they have no competing interests. Thank you for your contributions to this post. Some useful further reading for me! I would be keen to know your updated thoughts on strategic use of metallic, copper touch-surfaces as an adjunct to (not substitute for) good cleaning and hand hygiene practice. (Not surface coatings, oxidised fabrics, nanotechnology or powders in polymers, but metallic copper, as that is what most of the efficacy data that I have seen is based on). In particular, which organisms / pathogens are proven to survive on contact with copper surfaces under typical indoor conditions (ie @20 deg C, ~22% RH). Knowing this will help me be accurate and responsible in my activities which centre around the strategic use of metallic antimicrobial copper surfaces to reduce the risk of infection. Research* showing the rapid destruction of microbial genomic material, including plasmids, coupled with the multi-modal contact-kill mechanisms of copper & copper-alloy metals encourages me that this is a responsible approach with low risk of driving AMR to copper surfaces. What worries me is the wide-spread and seemingly indiscriminate use of silver-based antimicrobial surface treatments, which are shown to have negligible efficacy** under typical indoor usage conditions. Do you agree that use of effective antimicrobial agents in a sub-effective manner increases the risk of microbes with resistance mechanisms proliferating? b) what infections are the problem – are touch surfaces involved in transmission? d) which antimicrobial surface options work under the usage conditions? Continuous learning is a vital part of due diligence, and I welcome your assistance. If you would rather not post a reply to me on a forum, please contact me directly. But I welcome open and frank discussion, and opportunities to learn.